There are many long-distance walks in the England. There is the Coast-to-Coast (my favourite) clocking in at 200 miles, the Pennine Way is about 270 miles(ok this does end in Scotland, but just barely) , and for those who really didn't feel like going to work for a few months there is the South West Coast Path which is a staggering 630 miles. Now as I sit here in my London flat I wonder, are there any long distance paths around London? 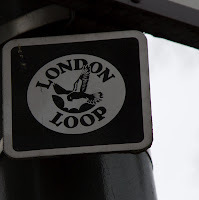 There is of course the Thames Path, but that only traipses in thru London. It starts (or finishes) in the hilly Cotswolds (where there is another long distance path, the Cotswold Way). Is there one that can be tackled easily in weekends if need be, and utilises London's already awesome transport system? Why yes-- the London Loop! Grab you oyster card... Lets Go! The book we will be using on this fun adventure to guide is 'The London Loop' by David Sharp. You can pick it up online, at your favorite bookstore, or if you are still unsure, rent it from your library! We arrived at Kingston station about 20 minutes after leaving Waterloo Station. There was a trail marker right outside the station indicating where we were to head to. Now I should mention there were spots on the trail where it was NOT entirely obvious where to go. If you look at our GPS map it is quite obvious where these points are. I would never suggest walking a path going solely on signage. Use a book, plot your route on a map/GPS... never rely on one source! I will only touch on some of the aspects of this section of path. This was the first section of our walk and by far the nicest part of it. 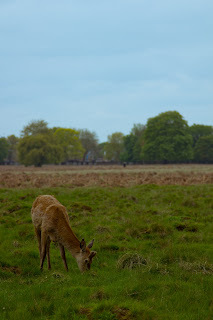 Bushy Park is one of the Royal Parks and the 2nd in size only to Richmond Park. What it lacks in size though it more than makes up for in content. Seemingly almost domesticated deer graze idly as you walk within mere feet of them. If you are lucky they may look up at you, only to return to their munching. This park was once owned by Cardinal Wolsey as well as the beautiful estate adjoining it, Hampton Court. However, a visiting Henry VIII liked it so much, he decided to take it from the Cardinal. I suppose that is a compliment? If you only fancied staying near Bushy Park or if you wanted an 'easy' day-- I highly recommend going to Hampton Court. It looked like a lovely place, with its own gardens and maze! 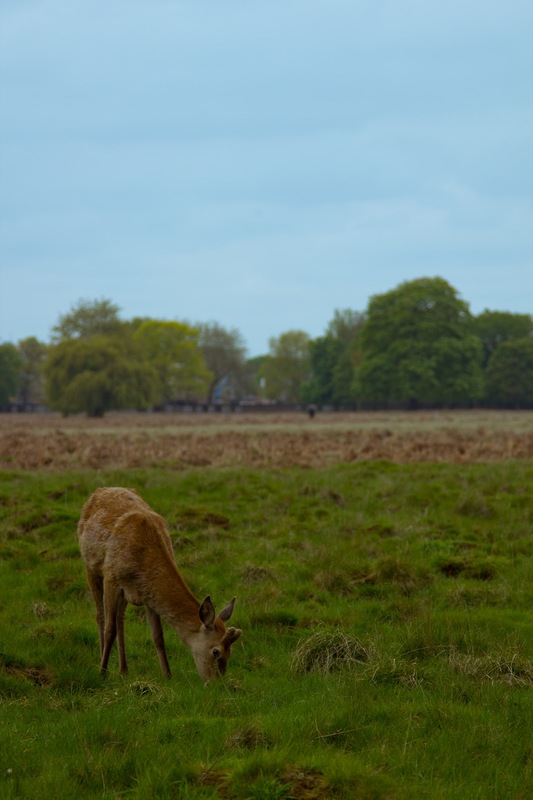 Bushy park is full of lovely grassland, ponds, wooded areas, and gardens. In fact, I could not get over the colors bursting from some of the flowers in the park, particularly in the Woodland Gardens. Azaleas and rhododendrons from soft white to bold pink were surrounded at their feet by small carpets of bluebells. 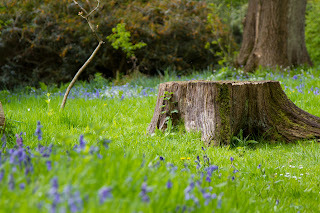 Top it off with a quaint cottage and you half expect Snow White to pop out from around a tree. Crane Park logically follows the Crane River. There are numerous paths to take here, but if you follow the river you can't go wrong. 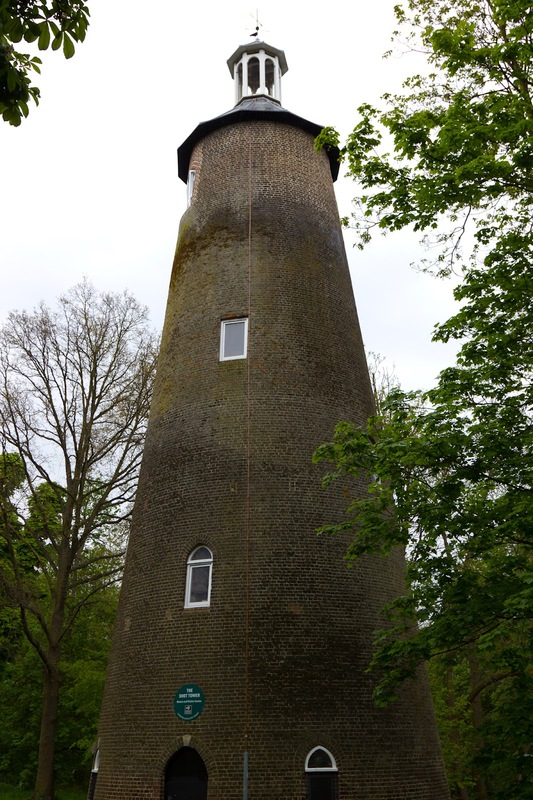 The highlight of this section was the Shot Tower, which back in the 16th Century was part of a gunpowder mill. Its function? Men would drop molten lead into a vat of water to make shot... seems a bit extreme? Nowadays it is used as a Nature Center. After another road diversion (there is a pub there, stop if you want a pint or food! ), you are back on green at Hounslow Heath. And what green it is! It seems a bit untamed and wild, a contrast from the nicely designed Bushy Park. However, that is one of its best attributes. As far back as the Norman Times Hounslow Heath has been in the record books. It has had many uses: hunting ground, prime location for highwaymen and robbers, agriculture, and even a dump. Luckily most of its former functions (sadly except the last) have disappeared, leaving a lovely nature reserve full of paths for walker, cyclists, and horses. According to the book, the Crown and Sceptre Pub was shortly after Hounslow Heath on Staines Road. However, much to our stomach's dismay, the pub was boarded up. With not much farther to go, we trudged thru Donkey Wood and then shortly came face to face with Heathrow Airport. A quick walk down the A30 (on pavement of course) brought us to Hatton Cross Tube station. Brompton Cemetery is easily accessible from Earls Court , West Brompton, or Fulham Broadway tube stops. Originally created to help cope with the sudden increase in population (and therefore deaths) in London, it was opened in 1840 and houses over 35,000 monuments. Remember that Brompton was considered on the outskirts of London back in those days, so placing a cemetery there seemed a great idea to help with the dirge of disease and hazards of overcrowded cemeteries in Central London. We started at Earl's Court (and were greeted by a TARDIS... a good sign!) and made our way to the North Gate of the cemetery. The day was cloudy and there was a chill in the air-- perfect for cemetery walking. There are rows upon rows of gravestones and tombs, many overgrown with years of neglect. However, it added to the solemness and ambiance of the place, and there were some freshly laid flowers on some to assure us that the dead have not all been forgotten. Beatrix Potter lived close to the cemetery and actually used some of the names from the gravestones in her stories. So although not famous in life- Mr. Nutkins, Mr. McGregor, and even Peter Rabbett- became famous in death. Walking thru the cemetery itself is impressive, and even more so when you get to the crypts. These were recently made famous by the Guy Ritchie Sherlock Holmes movie, as it was where Lord Blackwood was laid to rest (or was he?? dun dun duuun). Emerging from the South Gate, one has all sorts of options. Football (soccer) fans can head right and see Stamford Bridge, home of the Chelsea Football Club. We headed left on Fulham Road towards the museums. Along Fulham Road are plenty of pubs, cafes and restaurants in case you have built up an appetite. I recommend Goat In Boots, a pub with a decent list of ales and interesting food selection. Our walk took us past St. Augustine's Church, which was built in 1876 (keeping with the Victorian theme here) and is a lovely building both inside and out. I highly recommend stopping to snap a few photos! A few minutes later we made to 'Museum Lane'. This road houses three great (and free!) museums. The Natural History, Science, and Victoria & Albert Art Museums can keep anyone busy for hours, making it a great way to spend the rest of a gloomy day. Be careful though you may have to queue as others may have the same idea! If the queues are too long (or its too nice a day to be indoors), you are a few blocks south from Hyde Park and Kensington Gardens. Best way to see them both? Rent a Boris Bike! The South Kensington Tube stop is close by, allowing you to get to wherever you need to go after a long day of some amazing, free, London sights. So, if you want to be authentic, one needs proper trachten (costumes) to have for Fest. This is dirndl's for the ladies and lederhosen (literally meaning leather pants) for the guys. There are of course the cheaper halloween ones but in Germany there are stores especially for them-- ranging from reasonable to downright expensive! Walking into Fest is like walking into an amusement park-- there are plenty of sights, smells, and sounds catering to young and old. There are rides ranging from the calm and serene to the white knuckle roller coasters. Never trusting the games (and my German being a bit bad) myself I am sure they are like any games you find in an amusement park. And the food! You have your typical plump sausages (wurst), dried fish, fries (pommes), pretzels (brezeln), and of course for the sweet tooth, plenty of candies and chocolates! However, the real excitement is walking into the Fest Zelts (tents). The slightly stale smell of beer stained into the wood, mixed with the salivating aroma of the hendl (chicken) turning on the spit. This... is fest! It starts with one maß (liter) of beer. Thats when you dig into the chicken. The slight buzz pairs nicely with the salty chicken skin and moist meat. The Prosit (cheers) song starts and everyone sings along and raises their glass. Be sure to look at everyone while you cheers-- it bad luck otherwise! The evening continues-- more maß's are imbibed, more songs are sung, and before you realize you are up on the wooden table seats (not the table itself, thats a no no!) dancing and swaying to the music. You look around, everyone is up with you... everyone is laughing and singing along. Fest is definitely one of those experiences when is does not matter if the person next to you speaks a different language. All you need to do is raise your glass to theirs and shout "Prost!"